It’s easy to see that fall is upon us; with changing leaves and pumpkins everywhere we look. But did you know that pumpkin is so much more than just the symbol of the season? As temperatures begin to drop and your skin loses its lustrous glow of summer, look no further than the great pumpkin for answers. Loaded with over 100 different beneficial ingredients, pumpkin has easily been deemed one of the top super ingredients of all time. From the fleshy pumpkin pectin to the oil extracted from the seeds, the benefits of pumpkin are seemingly endless. This super fruit is naturally loaded with vitamins and minerals such as, A, C, E, K, zinc and fatty acids, just to name a few. This powerful fruit has shown time and time again to be extremely nutritional. But did you know that pumpkin is also low in molecular weight, making it ideal for applying topically to the skin? Softens, Hydrates and Soothes: The beneficial nutrients in pumpkin such as fatty acids and vitamins A and C help to maintain the skin’s lipid balance to protect against trans epidermal water loss. 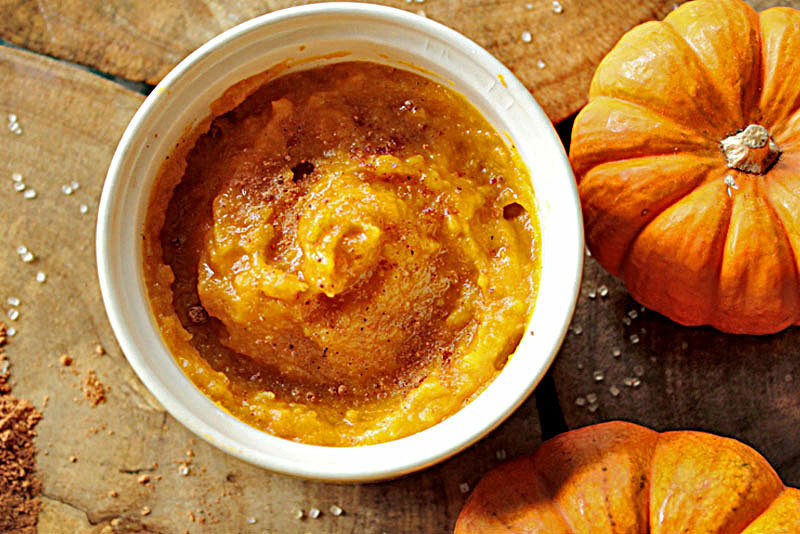 Brightens and Exfoliates: Pumpkin also contains natural fruit enzymes to safely and effectively dissolve proteins and digest dead skin cells found on the surface. This process increases skin renewal and improves the overall skin tone and texture. Improves Luminosity and Boosts Collagen: Pumpkin is a great source of vitamin C which has been shown to keep the skin’s elastin and collagen fibers from breaking down. Vitamin C also fights free radical formation and promotes healthy skin cell production for a beautiful, glowing complexion. Strengthens Skin: Pumpkin is loaded with Vitamins B, K and E to support barrier function and help to maintain a strong internal structure. This helps to prevent inflammation caused by environmental factors and compromised skin. Protects from Environmental Damage: Pumpkin has shown to have some of the biggest antioxidant benefits and free radical protection of any fruit. This means that are skin cells are protected from prematurely aging and breaking down due to environmental stressors and pollutants. Reduces Acne and Excess Oil: Pumpkin is invaluable for acne sufferers. It is chock-full of zinc, vitamin E and selenium which helps clear the complexion, heal the skin and control oil production. With all the unbelievable benefits pumpkin has to offer, it’s no wonder ABI Dermaceuticals puts 20% in its Polishing Pumpkin Micro Peel formulation. By combining the power of pumpkin, glycolic acid and a concentrated blend of botanical extracts, ABI Dermaceuticals has a pumpkin treatment like no other. Our nourishing micro peel instantly exfoliates, heals and repairs in single treatment. Let the power of pumpkin go to work for you. Give us a call to try a sample today.